The Ro-Busters Disaster Squad, Books One and Two (1983) | 'TAIN'T THE MEAT… IT'S THE HUMANITY! Beginning in 1981 Titan Books began publishing collections featuring reprinted stories from weekly British science-fiction comic 2000AD. Starting with the title’s most popular character, future lawman Judge Dredd, Titan published dozens of soft cover collections that showcased some of the UK comic-book industry’s biggest creative talents. 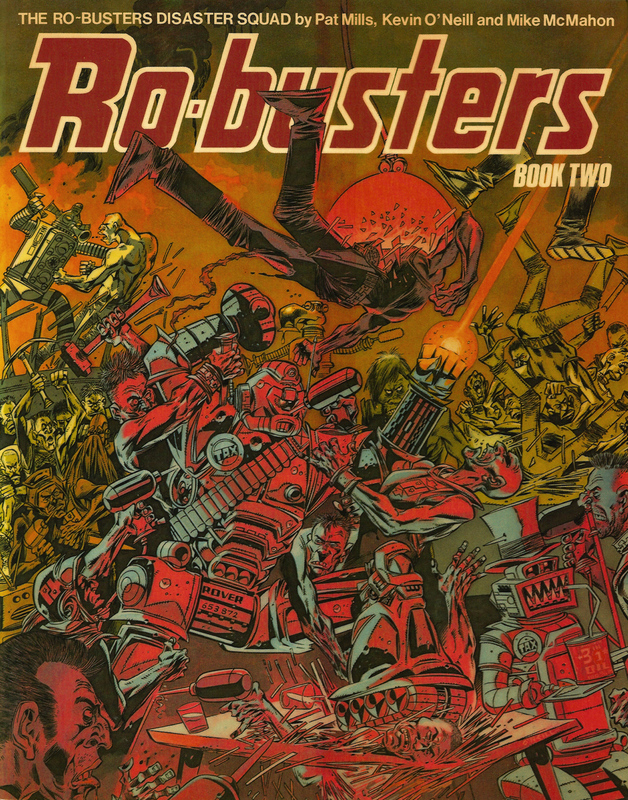 I’ve already looked at the 39 volumes featuring Dredd, as well as the four books starring Sam Slade, Robo-Hunter, so this time I thought I’d take a closer look at another favourite of mine: Ro-Busters. Created by writer Pat Mills the strip first appeared in the short-lived weekly comic Starlord, a sister title to 2000AD. The story dealt with the tribulations of a group of artificially intelligent robots who clean up after major disasters. The initial team comprised of ex-soldier bot Hammerstein, the perennially scruffy and foul-mouthed Ro-Jaws, the unbalanced ‘kill-dozer’ Mek-Quake, and their unscrupulous boss Mr Ten Per Cent. The stories were terrific fun, lively and action packed, and infused with Mills’ trademark satire. When Starlord was cancelled after just 22 issues Ro-Busters was folded in 2000AD where it quickly proved popular with readers of ‘The Galaxy’s Greatest Comic’. Mills continued to write the strip while Kevin O’Neill and Dave Gibbons shared the bulk of the art chores (Carlos Pino and Ian Kennedy also pitched in on some of the early Starlord strips). The series came to an end in 1983 but Hammerstein and Ro-Jaws would go on to appear in the hugely popular A.B.C Warriors, which still appears in 2000AD. (Titan would publish four collections featuring the A.B.C Warriors, during the mid-Eighties and I’ll be looking at them in more detail soon). 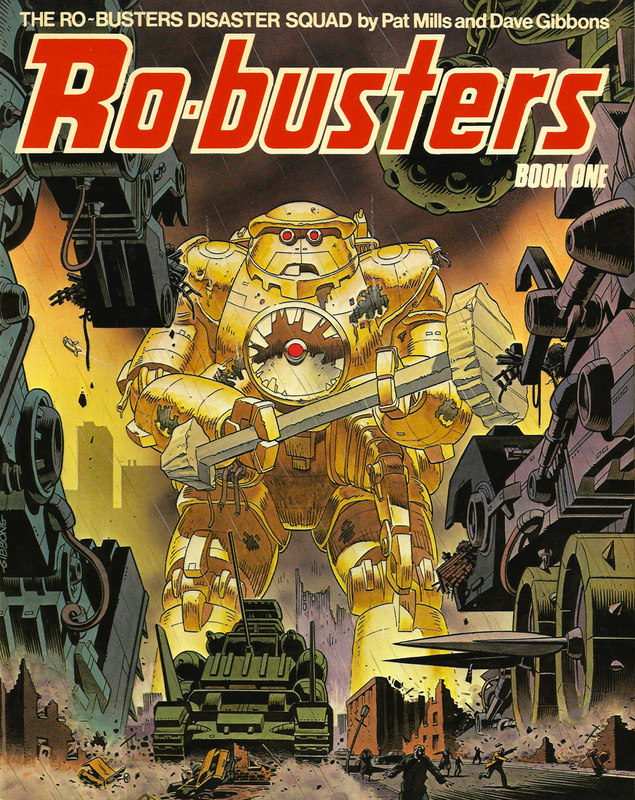 In 1983 Titan Books published two collections featuring Ro-Busters: The Ro-Busters Disaster Squad, Books One and Two. Each book measured 22 x 28cm, featured 84 pages of reprinted black and white material (with a few new bits of new artwork commissioned specially for the books) and sold for £3.50 (Book One) and £3.95 (Book Two). 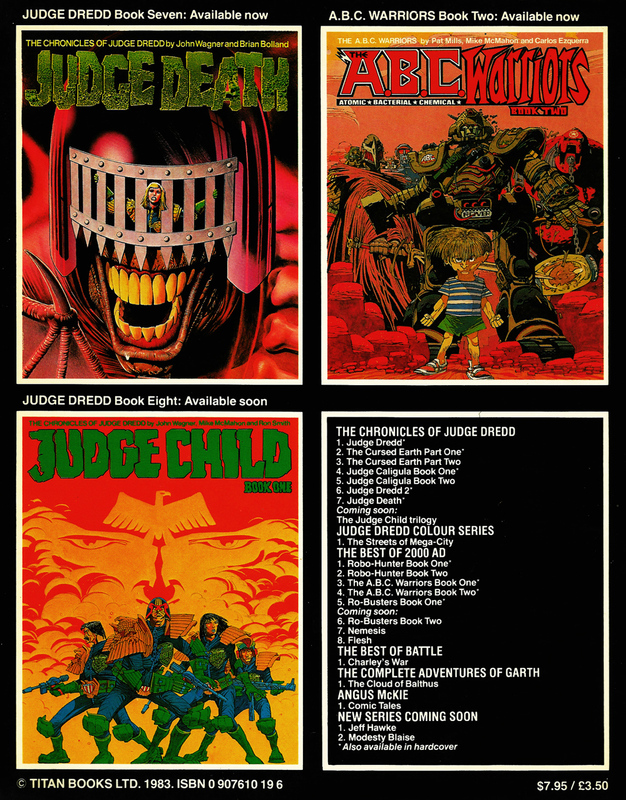 The covers were full-colour and featured new art by Gibbons (Book One) and O’Neill (Book Two). Both books featured full-page Introductions: Titan managing Editor Nick Landau’s appeared in Book One while 2000AD assistant Editor Richard Burton contributed to Book Two. Each book also featured a few reprinted covers and pin-ups from 2000AD and Starlord. On the back cover to each book other volumes in the Titan reprint range are featured, as well as of future releases. Considering the age of the books it’ll come as no surprise that both editions of The Ro-Busters Disaster Squad are now out of print. Luckily, all the Ro-Busters stories from Starlord, 2000AD as well as various Specials and Annuals, were reprinted by Rebellion in one handy volume a few years back. It may be a bit hard to find but The Complete Ro-Busters is well worth the effort. Personally I prefer the original Titan collections but that didn’t stop me from buying the newer volume when it came out in 2008. Here are both volumes of The Ro-Busters Disaster Squad, with annotations.